Deb’s Cats N Quilts was opened as an online business in 2002 while I was still living in my home state of SC. I continued the online store after a move to the mountains in 2003, and opened Deb’s Cats N Quilts as a storefront in Franklin, NC in 2005. 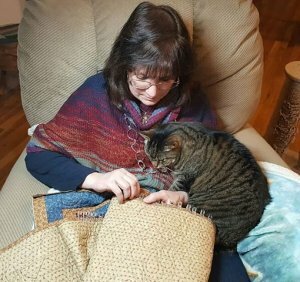 As a former freelance writer for QUILT magazine, an article I published “All I Know About Quilting I Learned from my Cats” became the theme for the shop. But much was going on behind the scenes….. In 2015, an idea and a few pieces of plexiglass led to a dream come true as I began designing for Creative Grids®. My Creative Grids (CGRDH1) Cat’s Cradle tool was released at Quilt Market in the spring of 2015, followed by my (CGRDH2) Strippy Stars Tool that fall, and my (CGRDH3) Turbo 4 patch in the spring of 2016. Before and after each release I was busy designing patterns to go with each tool. My travel time increased with more lectures, demos, and workshops and Deb’s Cats N Quilts slowly became two separate and unique entities. Deb’s Cats n Quilts (the storefront) and Deb’s Cats n Quilts Designs. With the help of an amazing staff, the storefront continued to do what it had always done- Hold classes and club meetings, and sell quality quilting supplies, all with an emphasis on customer service. At the same time, I was busy with the design side of the company, designing patterns, traveling to speak and teach workshops, and hosting 2 annual retreats. Both the storefront and the design company were full-time jobs and in 2016 I realized that one person could not continue to oversee both. There was just not enough time in the day. That’s where good friend Lindy Blanton came in. In July of 2016, Lindy purchased the storefront (now renamed Sassy Stitches) so that I could devote full time to Deb’s Cats N Quilts Designs. Although there have been changes as the new owner puts her own personality into the shop, the storefront still provides the same “purr-fect” shopping experience and warm cozy atmosphere that it’s been known for all these years. If you are ever in Franklin, I hope you'll stop in. To see what’s going on at Sassy Stitches click here to visit sassy stitches web site OR visit Sassy Stitches on facebook.